Lake Como is a place of breathtaking beauty steeped in elegant history; of grand villas set against an epic mountain range, where romances play out on the deep blue lake, that stretches like an sapphire jewel between Italy and Switzerland. When Damien and I take a romantic break on a recent work trip to Europe, we decide to return to Lago di Como. We first visited on our honeymoon seven years ago and fell in love with the beauty and history of the place. I’d heard great things about The Grand Hotel Tremezzo – its beauty, warm hospitality and world class amenities. We simply had to check it out. As soon as we pull up in our chauffer-driven Six Series Mercedes we know we’re in fine company. Stretching out along the lake, at the very front of the hotel, is “T Beach”. A cool, azure pool floats on the river, along with a private strip of sand and a stylish champagne bar that invites lazy summer indolence and casual reflection. Immaculately dressed Europeans with terracotta tans decorate the daybeds, sipping Pommery and Aperol Spritzers, their white linen and gold jewellery glinting in the sunlight. Beyond that, an enormous stately villa rises up invitingly, covered in dense ivy, and with an elegant pebbled driveway and uniformed bellboys ready to flag you a taxi or carry your bags. The Art Nouveau-style hotel, which originally opened in 1910, is set on a vast 20,000 square metres of private gardens. It’s positioned at the picturesque junction of two branches of the lake, directly across from Bellagio. A hundred windows capture pristine waters framed by the pink-tinged Grigne Massif mountain range. We check in swiftly and head upstairs. Our ‘Prestige Lake View Room”, doesn’t disappoint. Tranquil, with grey blue walls, it features a gorgeous carved, gilded bed, antique furniture and elegant sea foam drapes complement the lake and pool below. 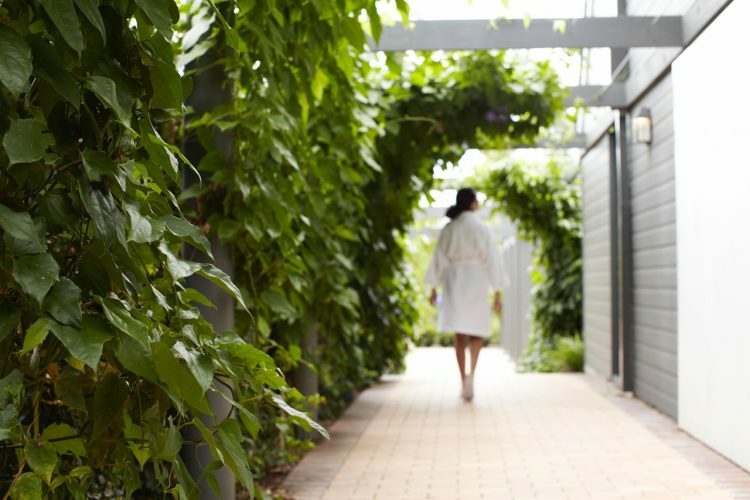 First things first – we make a booking at the famed T Spa before heading out to explore the lake. The hotel and spa recently enjoyed a multi-million dollar refurbishment that, in partnership with spa brand ESPA, saw the neighbouring 18th Century Villa Emilia overhauled with five treatment rooms, a Hammam and nail bar along with a three-storey gym and private spa suite. The star of the spa, though, is the 15m heated indoor infinity pool, that enjoys rockstar views of the glittering lake and offers a host of hydrotherapy surprises. A kind of water park for adults, all manner of aquatic pleasures await as you swim through a tunnel into a hidden cavern. There’s a cascading waterfall neck massager, a ‘bubble bed’ (a contoured recliner with hundreds of tiny bubble jets that tantalise your back) and a powerful jet foot massager on the bottom of the pool. Swim through a doorway to an outdoor Jacuzzi or climb out and drip dry on the sundrenched lounges. After your treatment you can take Moroccan mint tea on daybeds, set before gratuitous view of the lake, as the melodic tinkle of water bubbling over the wet edge pool lulls you into a soporific slumber. Our three days in Lake Como whizzes by in a kind of dream-like haze. It seems, at times, almost too pinch-myself gorgeous. In the mornings, we explore postcard-perfect inlets and coves of the famous lake and ambol through villas, like the famous Villa Del Balbianello. One day we hire the hotel’s boat, one of those stunning mahogany-clad speedsters fashioned for Sophia Loren, (but this one was owned by a noble Venetian family) and, with the help of our friendly skipper, set course up for Bellagio to wander the hillside laneways filled with quaint shops and restaurants, stopping, or course for a fresh seafood pasta. Lazy afternoons are spent poolside at T-Beach or the stunning Flower Pool at the back of the hotel, which is fringed by fragrant jasmine, Riviera palms and heaving bushes of hydrangeas in dusty blue, pink, purple and green. The spoils of spring are everywhere and the perfume fills the air. Decadent days give way to magical nights and we enjoy romantic meals at the hotel’s fine dining restaurant La Terrazza (try the Milanese Risotto with gold leaf) and L’Escale Fondue & Wine Bar, where you get to cook Swiss-style at your table. For something a little more casual, head to Pizzeria Balognett in the hills behind the hotel. They make the thinnest, crispiest pizza I’ve ever tasted featuring star ingredients grown in the owner’s garden. Over breakfast on our last day we meet the hotel’s gorgeous CEO Valentina De Santis, whose family has owned the hotel for 40 years. Valentina grew up with the hotel and now lovingly oversees it and the staff, who clearly adore her. In the garden behind the hotel you can climb to the top of the hill and look out over the lake, and there on a rock sits Bobo, Valentina’s childhood teddybear, who has become the hotel mascot. He sits watching over the villa and its myriad guests with his calm, immutable gaze. On our last day we hike up to the top and say goodbye to Bobo. A ritualistic farewell seems fitting for what has been such a personal and sentimental stay. He looks kind of sad, so we tell him we’ll be back. And with that, it’s back into our car for the hour’s drive to Milan, and onto France.